3:30PM - Miguel and his helper will arrive to your villa to set-up. 4:00PM - Miguel will start each class with preparing Salsa and Guacamole and will show you how to make "Real" Margaritas, so you can snack some while you're cooking. Hopefully you would have practiced your knife skills before you came, because as Miguel's Sous Chef you will be busy chopping and stirring and grilling till around 6:30PM to 7:30PM when dinner should be ready. Chef Miguel will serve dinner with another pitcher of Margaritas and finish with an after dinner Liquor called Xtabentubn (Mayan liquor of anise and honey.) If you are interested in a Tequila pairing, let us know beforehand. Sikil Pak Mayan Salsa made with roasted pumpkin seeds. Tikin Xic Mayan Grilled Fish; Fresh Fish seasoned with Recado Rojo (uses achiote a Mayan red seasoning, not hot!) wrapped in banana leaves along with sour orange juice and grilled. Cochinita Pibil (Most Popular Mayan Everyday Meal) Pork seasoned with Recado Rojo (achiote) wrapped in banana leaves roasted in sour orange juice, served shredded along with corn tortillas for making tacos. Queso Relleno Mayan Stuffed Cheese; uses Edam cheese (the cheese that looks like a red ball) is hollowed out and stuffed with pork picadillo (ground pork, raisins, olives and spices that are sautÃ©ed together to make a sort of hash) then the cheese is wrapped in banana leaf and steamed, has a red sauce. Ceviche Shrimp or Fish or Mixed. Grilled Fish with Mango, Pineapple, Poblano Chili and Avocado. Grilled Shrimp with Garlic and Lime. You have your choice of a Class on Mayan or Local Mexican Caribbean Cuisine. Not available on Saturdays, Sundays or Holidays. 1st - Chef Miguel comes to your villa rental you don't have to do anything but answer the door. 2nd - Don't worry Chef Miguel will bring all his own equipment (pots and pans, knifes and utensils) and all the food needed, however the villa should have enough plates and silverware for everyone, it would be nice if it has some platters and bowls for serving (most villas normally are stocked with these, if not your in the wrong villa!) The villa will need to have a 4 burner range and an working oven, microwave and a refrigerator and outside grill (you provide gas or charcoal.) If there is not a grill let Chef Miguel know and he will bring one in his truck. Also make sure there is ice for the Margaritas! 3rd - Vegetarians...This is the land where PORK IS KING, not tofu. With a big Emphasize on CORN, LARD, FRIED FOODS it's not the healthiest food around, but it is what it is, and you can't really experience it trying to change it into something it isn't. Would you expect to go to France to learn French Cuisine and not cook with Cream and Butter? Enough said. FYI: To those many whom ask about food allergies; the menus for the class do NOT contain, gluten (the Mayans use corn not flour) or peanuts (they use Pumpkin seeds), they DO contain dairy, and all the "HOT" chili items are always on the side. 4th - People Ask??? If someone in your group doesn't want to attend class but would like to eat with the group at dinner, no problem as long as there are at least 4 people taking the class, the rate is $30 per person. You're a light eater (Good for you! this food makes great leftover's) but it's the same price. Want your kids to eat with your group, children less than 5 years can eat for free, children over 5 years price is $10, children over 12 years are charged as adults $30. 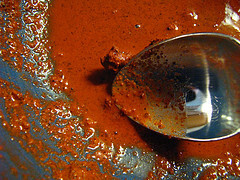 If you are going to be eating Mayan/Yucatecan Cuisine, you are going to taste Achiote. 1st it's not Hot, the deep red color would make you think it's Hot, but it isn't, in fact if anything it's a bit sweet. In the Yucatan peninsula Achiote is used everywhere and on almost everything, having nothing to do with Mayan cooking, if you go to one of the Mexican Grocery Chains and buy one of those roasted chickens it's on that. Most all the Mexican Grocery Stores for the weekend have a big pan of Paella that you buy by the kilo to take home, there is always a long line waitingâ€¦ and what do they use in Paella, saffron right, no it's too much money, some use Achiote the poor man's saffron.